These Pet Rescue level 676 cheats and tips will help you beat level 676 of Pet Rescue. 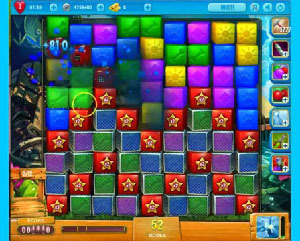 The objective of Pet Rescue level 676 is to rescue 12 pets and get 13,000 points in 52 moves. The pets will start on the board in their cages in Pet Rescue Saga level 676. You will need to drop them down to the bottom half of the board where you will find the same color blocks. Look to match the pet cages with the blocks to break them open. Continue to do this throughout the entire level or until you have at least 12 pets free from their cages. Bombs will continue to drop down the board. Look to activate the bombs to help you clear out the blocks around the pet cages. The bombs will also help you to clear out the mismatched color blocks that are keeping you from bringing down the pets to the bottom. In this level you will be given the paintbrush booster. Look to activate the booster when you need to either break open one of the pet cages or remove the blocks that are underneath the pets. This booster may only fill up twice so make sure you use it wisely! If you can, paint the blocks when you have more than one pet that will be collected.